This generation of employees, named after the post-World War II “baby boom,” were born between the years of 1946 and 1964. The Boomer generation came of age during an era of massive social change in the US and these individuals are often characterized as former hippies, those who fought traditional values and ideas. 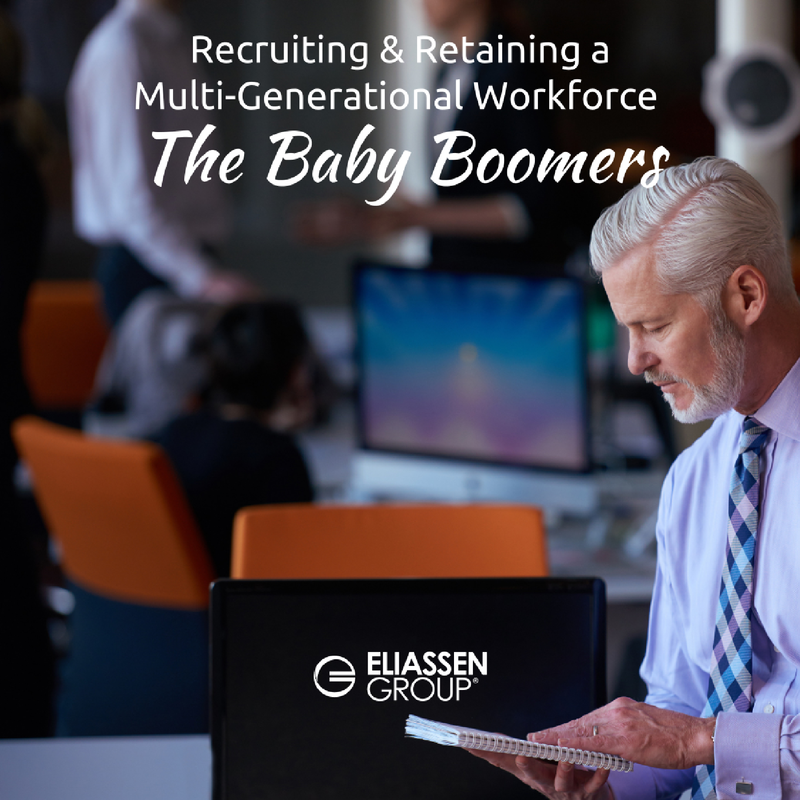 According to a recent Forbes article, “Understanding Baby Boomers at Work: Fast Facts for CHROs,” Baby Boomers tend to be highly educated and are very committed to working hard; many demonstrate a strong work ethic. Retirement benefits. For Boomers who are certainly closer to retirement than other generations, strong and flexible retirement plans are clearly important. Many Baby Boomers who are still working are intent on beefing up their retirement savings at this stage in their careers. The ability to mentor others and transfer knowledge. Baby Boomers have typically held a variety of roles that have involved ever-increasing levels of responsibility and expertise. And just because they may be transitioning to new roles does not mean they don’t still have a lot to offer in the way of knowledge transfer to younger generations. This is a generation that has always valued work and it’s important to them to impart these insights to others. New and different challenges that take advantage of their strengths. While these folks may have held high level management roles previously, they may be looking to scale back on the number of hours and pursue new areas that will not only enable them to keep working but to do so in a way that suits their lifestyles and interests. Mentoring programs. As mentioned above, Baby Boomers want to pass down their knowledge and expertise so by developing mentoring – and also reverse mentoring – programs that pairs them with younger generations, knowledge transfer can take place between both parties and benefits everyone. Development of Subject Matter Expert (SME) roles. In many industries, such as Life Sciences and Financial Services, having SMEs who can support those in key delivery roles can be extremely valuable. In these situations, mature employees can serve as advisors who have vast experience to draw from. Acknowledgement of expertise. Keep in mind that most Baby Boomers likely started their careers in very traditional companies and, over time, promotions came with public recognition and possibly larger offices and parking spaces. While times have changed, recognition for their expertise remains a valuable form of feedback for Boomers in the workplace. Consider instituting office recognition programs whereby colleagues can recognize each other’s achievements in a public way. Although Baby Boomers are headed towards the sunset of their careers, they still have much to offer employers and colleagues. Smart companies have learned to facilitate knowledge transfer between this mature generation and the rest of the organization so that the value of their experience lives on within the company and its employees. Do you have questions or would you like to chat about these strategies? Please contact us at solutions@eliassen.com and visit us on Twitter and Facebook to join the conversation.